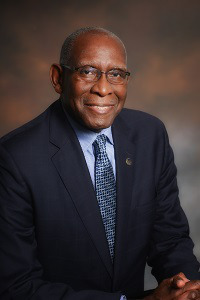 University of the Virgin Islands (UVI) president Dr. David Hall was elected to the Kansas State University Athletics Hall of Fame. Hall was a Kansas State (K-State) basketball player and is one of nine distinguished alumni inducted over the weekend. Named “All American” and three-year letterman for his athletic and academic accomplishments, he participated in two Big Eight Championships (1970, 1972) and still ranks in the following categories: third in rebounds (827), fourth in double-doubles (30), double-digit rebounding games (36) and sixth in rebounding average (10.1 rpg.). After graduating K-State with a bachelor’s in political science, Hall played professional basketball in Italy. This year’s inductees was the 12th class in the university’s athletics history. The official induction ceremonies took place on Friday, Sep. 28, and the inductees were recognized the following day during a halftime Kansas State football game. Hall has served as the fifth president of UVI since August 1, 2009.